BlizzCon 2015 was an exciting whirlwind of previews and reveals for all Blizzard titles. We hope you enjoyed the celebration of all things Blizzard as much as we did! There wasn't a lot of pet discussion during this year's convention, however there were a few announcements that caught our attention. 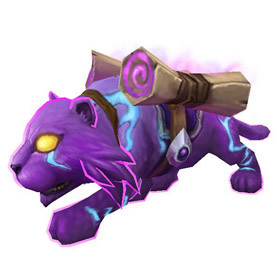 Brightpaw, the adorable mana kitty pictured left, is a charity pet coming December 2, 2015. All adoption proceeds through December 31, 2015 will be donated to the Make-a-Wish Foundation. Nibbles is now in-game. Players that purchase the Legion Digital Deluxe pre-order ($69.99) will find this pet in their inventories upon logging in. Be sure to check out Nibbles' interaction with the Illidari Felstalker mount! Blizzard's newest title, Overwatch, will have a promotional pet tied to the CE and Digital Deluxe version of the game. 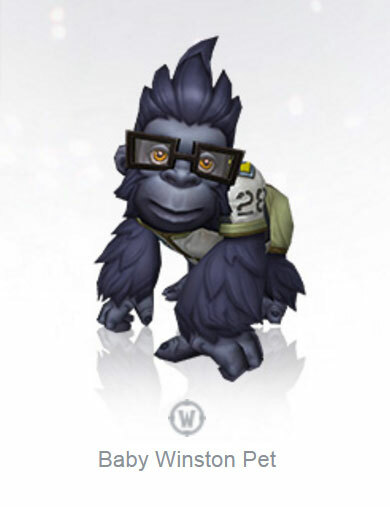 Players that purchase Overwatch Origins Edition ($59.99) will receive a Baby Winston pet (pictured right) in WoW. Note that although you can currently pre-order the game, this adorable baby ape has not been released yet. It will likely be available at a later date. New Archaeology Pets In Legion? During the WoW Game Systems panel, it was very briefly mentioned that archaeology would receive updates and new pet additions in Legion. No further details were provided. Last but not least, a teaser image (pictured below) was released during the Game Systems panel. It features two moose and their miniature counterparts. There has yet to be any confirmation that these bundles of cuteness will be available as battle pets, but we're certainly hoping! We look forward to Legion beta (start date still TBA), and hope to hear more information on any Pet Battle changes and new additions. Stay tuned for future updates on pets in Legion! 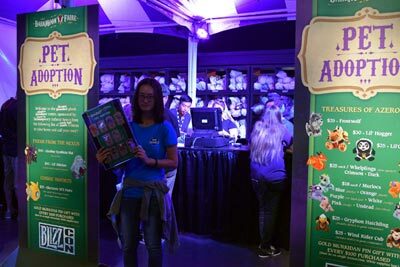 This year's WarcraftPets Community Meet-Up was held near Blizzard's Pet Adoption section of the Darkmoon Faire area, a happy coincidence! We had a great attendance — 50 people stopped by to say hello. Those that signed-in are now entered into our TCG giveaway raffle. We'll be randomly selecting the winner of a BlizzCon 2013 pet code for Murkalot shortly. The winner will be notified via email today or tomorrow. We'd like to thank Marzena for hosting this year's WarcraftPets Meet-Up. Not only did Marzena organize this year's gathering, she also baked some delicious pet-themed cookies (pictured right). 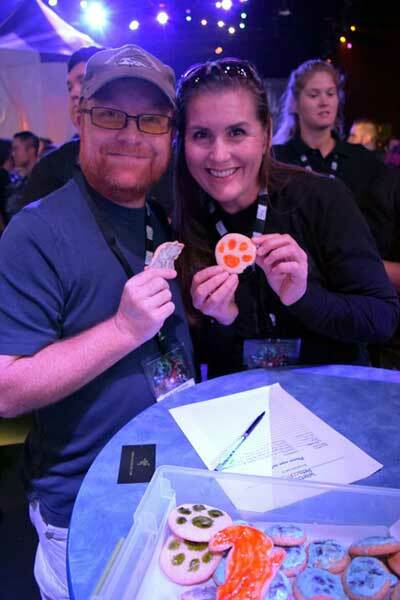 Frostwolf Pup, Cinder Pup, Lost Netherpup, Fel Pup along with paw print and battlestone cookies — almost too cute to eat! Here are a few thoughts that Marzena wanted to share about the event. "This year we met up with a lot of wonderful new people and of course some wonderful regulars that have visited in the past! It was great to meet everyone new and familiar and to discuss our favorite pets, ones we wish we had and ones we just obtained! Indeed, a big thank you to everyone that stopped by our Community Meet-Up. 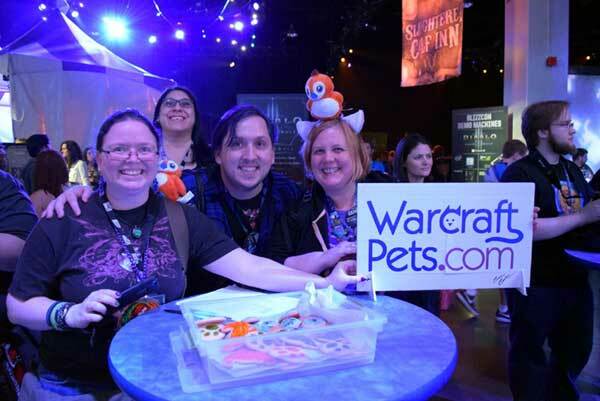 We'll be posting all of the wonderful BlizzCon 2015 Meet-Up pictures to the WarcraftPets Facebook page, so stay tuned. Everyone looks like they had fun. One year l'll make it there and meet you all. Good luck to the attendy that wins the pet. Excited about all the new pets coming. Hope you all had a WONDERFUL time at blizzcon! OMG my picture is on the front page?!?!?!?! Awesome!!!!! I enjoyed meeting Marzena and look forward to next year! I'd love a mini-moose pet....but anyone else notice how similar they look in design to baby moonkin pets? 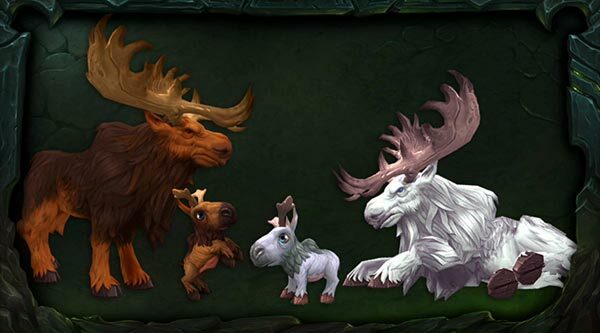 Perhaps the moose is a new, revamped druid form (brown for horde and white for alliance) instead of the stag and those are companion pets to match like we had with moonkin form? That would be amazing! Mounts would be cool too ofcourse. Those cookies look yummy! Pity my dog doesn't leave prints half as tasty looking.